While in my 40’s I taught myself how to dance from videos. Not just any kind of dancing…belly dancing. I fell in love with the beauty of the dance at a Renaissance Fair. The facts that my father’s father was from Greece; I was proud of my Greek heritage; and Greek music and dances were similar to those of other Mediterranean countries all made me want to belly dance! I was fascinated and physically moved by the music when I heard it. I had to learn about it! I bought several instructive videos on how to belly dance and CD’s of the music to learn the dance. I watched Egyptian beledi on YouTube and went to every Renaissance Fair I could to watch the graceful, beautiful dancing of the costumed ladies. I even did research on its origins. I never was athletic enough nor had the stamina enough to dance as fast as many of them did. I never had the flat muscular stomach for the dance. I never could do a lot of things those well trained women did. But I could and still can do a lot of the things they can do. Better still I was exercising; having a lot of fun learning and dancing to the Middle Eastern music: and I could move a veil with grace and beauty. I did use the slower music and still have a lot to learn. But I am having so much fun! I enjoy surprising people who see me as a mild mannered, sweet, grandmotherly woman. Once I told someone that I had been studying belly dancing, they looked dubiously at me. They were quite surprised when I, a middle aged, slightly pudgy, grandmotherly woman showed them that I really could do hip flips, undulations and other moves. One day I was showing a female co-worker that I could in deed do some of the moves of a belly dancer. Unbeknownst to me a male coworker happened to observe the moves. He was so impressed and surprised he gave me a $1 bill as a “tip.” Talk about surprised, I was tickled and surprised!! I now restrict my moves to slower belly dancing, figure 8 hip movements , shimmies, arm movements and various movements with a veil. I am working to regain my skills playing the zills (finger cymbals) too. When I was in my forties on a visit to my parents I gave them a demonstration of my skills. My father although in the throes of dementia was tickled pink that I had learned to belly dance. After watching me dance some, Daddy excitedly said, “She’s got it!” He got up from his recliner, got his camera and took these pictures. Remembering his reactions and those words still make me happy even now over 15 years after his death. 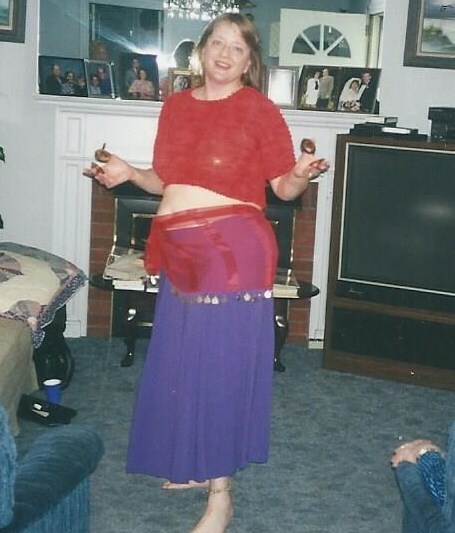 Me at 40 plus, belly dancing with zills. I particularly love the veil dancing, which can be quite enchanting. 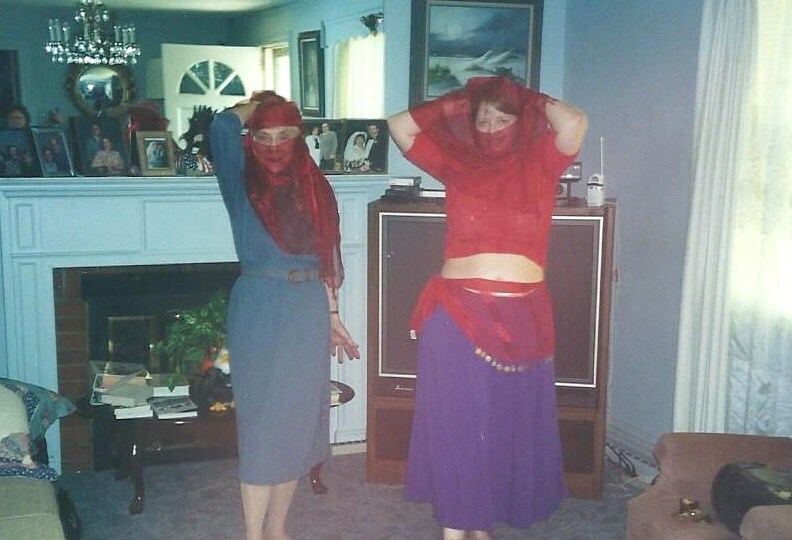 Here is one photo of me posing with my 70 plus year old aunt while teaching her how to belly dance. I was in my early 40’s then. Aunt Helen at 70 was quite a dancer in her own right. She could square dance, samba, and fox trot with the best of them! Sadly she passed away a few years ago. My 70 year old Aunt Helen and I posing with veils. My husband was never interested in watching me dance. But you know what? I danced just for me!! 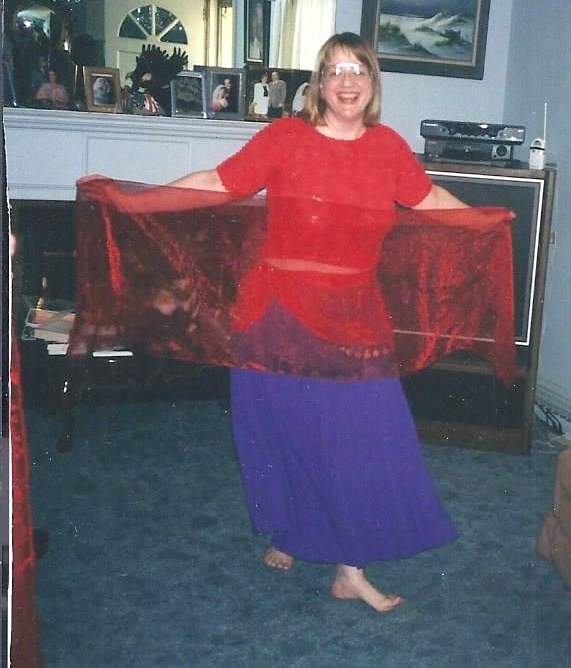 Over the next ten years my husband’s illness and physical problems and my work called me away from belly dancing. In 2009 my husband died. The following year my doctor put me on a restriction to not lift over 20 pounds because of sciatica from degenerative disc disease. Since no one was interested in hiring an almost 60 year old with “back problems,” I retired a little early from nursing. Seven years later I am older, weigh a little more and still have back restrictions. But my back has stabilized. For a long time I considered belly dancing to be way beyond my ability and too risky for an “out of condition”, woman in her 60’s! I was afraid I would permanently damage myself if I did some of the fast dancing. So I let dancing this pleasure pass me by for a long time until recently. After treatments by a chiropractor and improvement in my condition, I asked my doctor about resuming belly dancing. She encouraged me to try it by going slow in my practice and not doing anything that causes a sharp pain or a return of the sciatica. So I discovered a weekly class with an experienced belly dancer and have learned two routines. I think the exercise has helped me lose some weight and I feel great. I walk and hold myself proudly and I feel proud too. Also I started working on my own fancy costume from a sari I bought over 7 years ago which I never got to use. I will write another post about this when I finish it! So if you are looking for a fun, energetic, beautiful, challenging, entertaining exercise to do alone or with others, for yourself, your spouse or for money, Belly Dancing is the one I would pick again….if I were much, younger and had a good back again. Oh, and men can belly dance too! Please explain mad? I am not sure how you meant “mad”. Hopefully wild and crazy instead of maddening? How “joyful2be”! It is fun to surprise people sometimes, isn’t it? it seems like a fun hobby, congrats on your progress (even if a while ago). Myself and my daughter belly dance together to all sorts of music and enjoy dancing for manly the intrinsic value, but sometimes to an audience for their enjoyment too. I am no spring chicken and my daughter is a mummy, so we are showing others that it doesn’t matter a fig what shape you are, how “good” you dance, but that you enjoy dancing and want to share that enjoyment. Thank you for sharing your lovely post. Hi wonderful!! I hope that belly dancing is not a dying art. It is so beautiful, fun and exciting. Thank you for sharing about you and your daughter. How old is she? I wish I could get back into beledi but with back problems I am afraid to. I loved the ceiling dancing part especially. I have posted an out of focus image of me and my daughter to share just enough for you to see how old we are approx. Enjoy.